After months of pruning, pulling and managing the 10-acre vineyard, Parallel 44 Vineyard and Winery, Kewaunee, is ready to celebrate with the annual Harvest Fest on Saturday, Sept. 8, from noon to 6 pm. 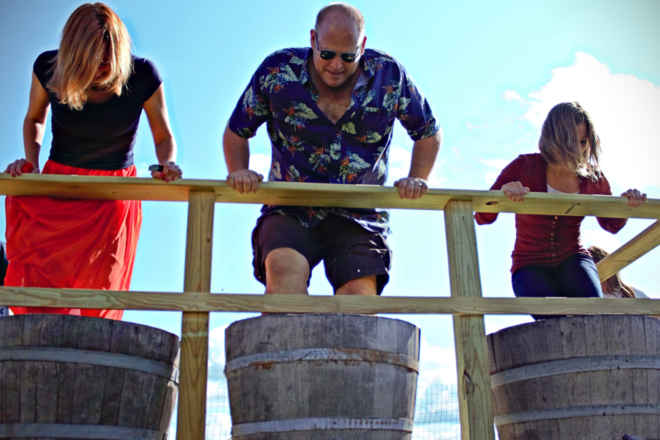 Compete in the grape stomp, take a tour with the winemaker, enjoy a wagon ride around the vineyard, relax to live music on the patio, indulge in delicious food from local food trucks, and taste some of Wisconsin’s most awarded, locally grown, world-class wines. Admission is $8 and includes five wine samples, a logo glass and drawings for free items. The event is kid-friendly, so bring the whole family for an unforgettable celebration at the vineyard. There will be a grape stomp at 3 pm. The grape stomp competition is open to anyone interested. Harvest Fest is also a great opportunity to take in a view of the 10-acre picturesque vineyard. There will be live music by Kevin Van Ess and The Talk of the Town and food will be available to purchase from Taste of Ethiopia and Caribbean Cruiser food trucks. There will be a variety of local craft vendors displaying and selling their products, and winemaker Steve will host tours of the vineyard and production facility. There will also be games for kids and wagon rides. There will also be event-day-only specials on all locally grown, award winning wines. For more information visit 44wineries.com.